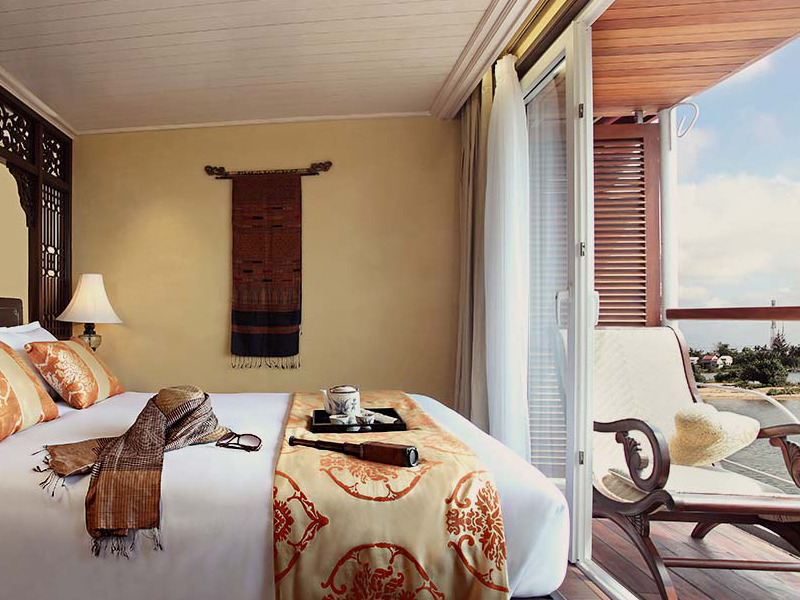 The best of rural Cambodia is offered with this cruise program. See the unseen, discover ancient per-Angkorian temples, relish the cordial smiles of the inhabitants of this region and feel emerges with the water landscape of the Tonle River. River cruising is the ideal way to explore Indochina, see the mighty Mekong and cruise from Siem Reap to Saigon. Explore one of the world’s great rivers on this boutique cruise on the Mekong, passing small riverside villages and sleepy temples that, being inaccessible by road, are well off the tourist trail. These river cruisers are the ideal way to explore remote locations while retaining access to luxury accommodation, facilities and food back on board. 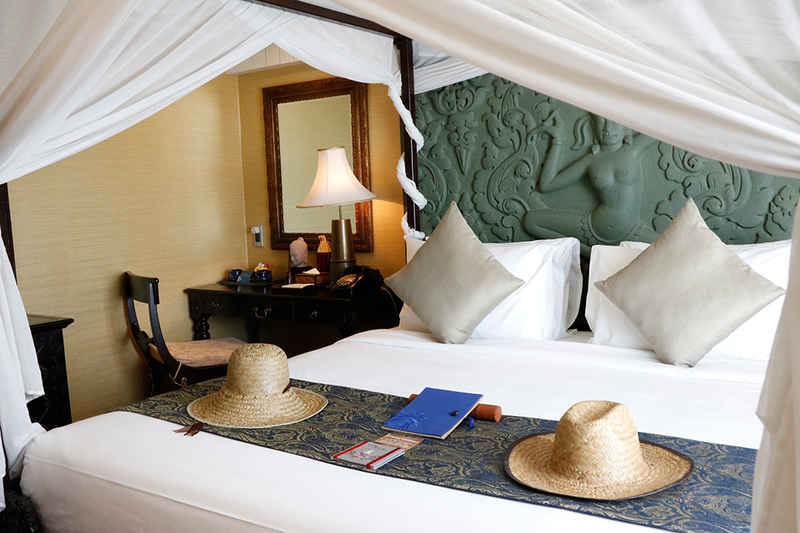 This journey can be taken either downstream & upstream, ending or beginning at the legendary temples of Angkor. 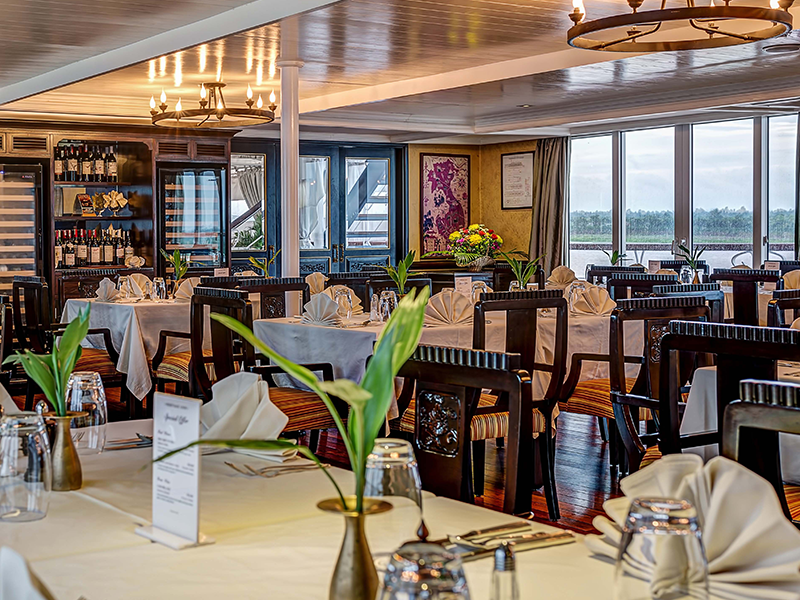 A lower Mekong cruise that modules the diversity of the rich, local and evergreen life of the Mekong Delta. Gives a full insight on the Mekong at its last “meters” before the ocean and displays the importance of the delta to Vietnam and actually the whole planet. Like pearls on a rope you will collect all your memories of this fascinating spot on our planet. 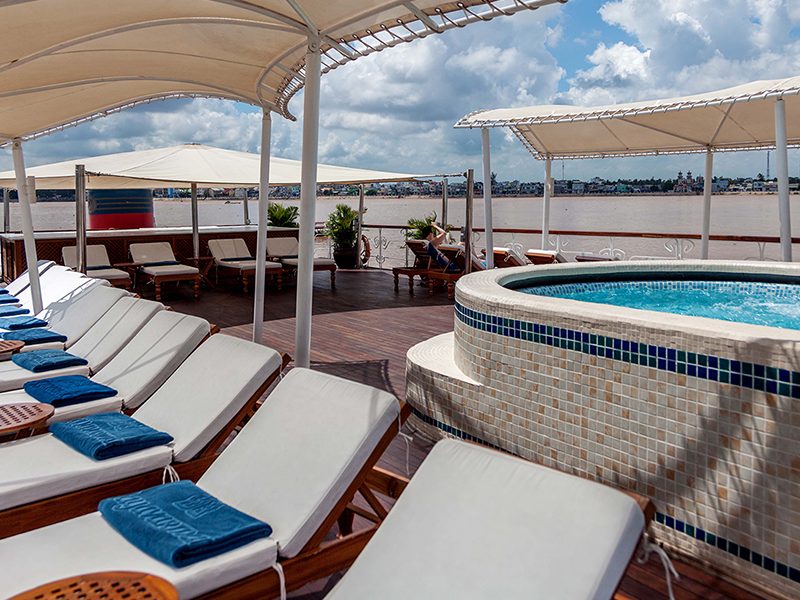 A half day leisure cruise will provide “the” magic therapeutic Mekong River cruise moments as add-on. Start your tour in Phnom Penh, the city was once the pearl in Asia. It’s an amazing capital city of Cambodia that bespoke for centuries of incredible history and culture which can still be felt at many street corners. Follow the itinerary and visit the Royal Palace, National Museum and few more attractions before lunch at the local restaurant. Your tour ends with a “cyclo” ride back to the ship through the bustling streets of downtown Phnom Penh. As the evening unwinds enjoy your supper with a good glass of wine and marvel at the skyline of Phnom Penh and the calming flow of the Tonle River. Continue sail downstream the Mekong during breakfast time and stop at the Island of Koh Oknha Tey. This spot in the middle of the Mekong owns its fame for the manufacturing of high class silk products. The cruise comes to an end. We get ready to disembark and take a local boat to the shore passing a vast floating community. Upstream and Downstream indicate the direction, the Ships will travel. 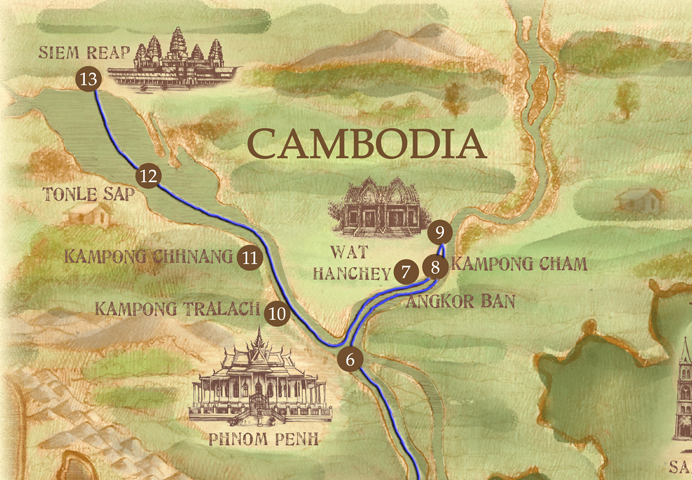 Downstream means from Siem Reap to Saigon. Upstream is the opposite direction from Saigon to Siem Reap. What is the difference between Low Water and High Water season? Low water season: The water level goes down and very low in Tonle Sap, so the Ships have to dock in Kampong Cham, where the embarkation and disembarkation will take place. It takes 4.5 hours for our coaches to transfer to the meeting point in Siem Reap (Victoria Angkor Resort & Spa). High water season: The Ship could cruise along in Tonle Sap and dock near Siem Reap pier. It just takes 45 minutes for our coaches to transfer to the meeting point (Victoria Angkor Resort & Spa). The embarkation and disembarkation of the Ship will take place near Siem Reap pier. Do I need to arrange visa before arriving in Saigon or Siem Reap? For most foreigners visa are needed for both countries. Please check with the Vietnamese and Cambodian embassies in your country. During the upstream cruises (SGN-REP), Heritage Line could support to arrange Cambodia visa at the border. The visa fee of USD 37 per person (subject to change during public holidays and others terms) will be added to their onboard account. For downstream cruises (REP-SGN), Heritage Line could support to arrange Vietnam visa as well. But as the visa has to be issued in Phnom Penh, the processes is difficult and expensive (visa fee will be advised at the time you request for). We strongly recommend arranging Vietnam visa before arrival in Vietnam or Cambodia. Is an E-Visa accepted in Vietnam and Cambodia? Please note that both Vietnamese and Cambodian E-Visas are not accepted for waterway entry to either country. Passengers who wish to obtain their own Visas before the trip must apply directly at a Cambodian or Vietnamese Consulate or Embassy, or by other methods, that will allow them to receive a normal Tourist Visa-for the country they will enter into on the water. For upstream journeys (Vietnam to Cambodia) a Vietnamese E-Visa is acceptable for entry by air to Vietnam-but for the water way entry to Cambodia, a Cambodian E-Visa is not acceptable. For downstream journeys (Cambodia to Vietnam) a Cambodian E-Visa is acceptable for entry by air to Cambodia-but for the water way entry to Vietnam, a Vietnamese E-Visa is not acceptable. Passengers who have obtained E-Visas-for the country that will be entered by water-will be required to apply for new onboard and pay all visa fees. Promotion is subject to availability and applies for level of cabin categories, Superior, Deluxe and Deluxe Executive (Anawrahta only). The validation of this promo is for new FIT bookings (Double or Single). The offer rate is not combinable and deposit is non-refundable ! All cruises include group shore-excursions, entrance fees, transportation, tour guide services (English speaking), taxes, fuel, river pilots, port dues, transfers in Saigon and Siem Reap from/to the meeting point to/from embarkation/disembarkation point or vice versa. Meals are included full board. Drinking water, coffee/tea (from jug) is included all day. Fruit juices are included in addition during breakfast.